Birthday Girl Glitter Hoodie. Every birthday girl should be able to express herself during the month of her birthday. Designed with glitter on a black 50/50 cotton / poly hoodie. 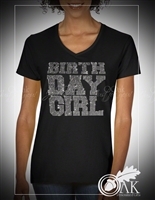 $6.50 shipping Birthday Girl Oversized Rhinestone Tshirt. Oversized fonts in crystal clear rhinestones on black 50/50 tshirt. $4.00 shipping Queening since "_____". Celebrating birthdays can be fun, jazz up your big day with some bling. Let us know the year, and we'll do the rest. Does this shirt make me look (my age)? This simply designed rhinestone and glitter Tshirt can be personalized with your age. Sure to be a topic of conversation, as I'm certain that you and beautiful and this tshirt will DEFINITELY not make you look your age, it'll make you look much younger. $4.00 shipping Zodiac Sign Glitter Tshirts. Every birthday girl should be able to express herself during the month of her birthday. Designed with your choice of colored glitter on a black 50/50 cotton / poly tshirt. $5 for 2XL and up The Coldest Queen of them all birthday tshirt. This Queen is rocking boxed braids, white long sleeved top with a faux fur collar and faux fur trimmed at the wrist. She also has an abundance of diamonds / ice around her neck and on her finger, not to mention the jewels that are in her crown. Fonts are in red glitter to match the crown. Available in all 12 months. Made from 100% Poly with a soft cotton feel. Available in white only.